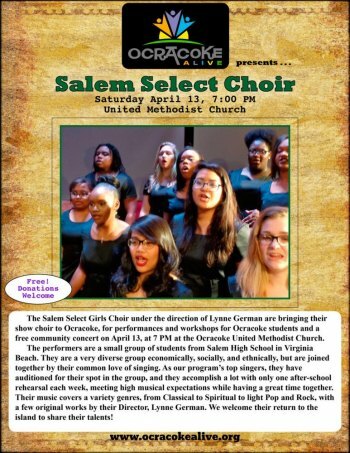 The Salem Select Choir and Men's Exchange, under the direction of Lynne German, are bringing their show choirs to Ocracoke for performances and workshops at Ocracoke School, followed by a FREE community concert at Ocracoke United Methodist Church on Saturday evening at 7pm. All are welcome to hear these amazing singers share music from a variety of genres from classical to spiritual to pop and rock. The Salem Select is an auditioned girls’ ensemble with eight singers, and the Men’s Exchange is a similar ensemble with three singers. These students are all members of the Salem High School Madrigals Choir in Virginia Beach, VA. They are highly motivated singers, and each of them has achieved individual and group awards, has received “Superior” ratings at our District competitions, and has sung for a variety of venues. Having performed on stage with the Virginia Chorus Women, at the Virginia Convention Center for Leadership Events, and in our local community for Black History Month events, our singers represent themselves and our school well with their energy and musical talent. 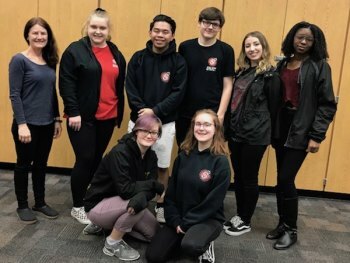 The Salem HS small ensembles have been singing in Ocacoke with the Arts Partnership for 4 years now, and the students always remember their time on Ocracoke as a highlight of their year.